Overall spending during the holiday weekend fell 3 percent from last year to $57.4 billion, but not because Americans decided to take a stand against retailers starting Black Friday sales before the turkey hits the table. According to the National Retail Federation, the number of people who went shopping over the past four days was up slightly, increasing to 141 million from 139 million in 2012. 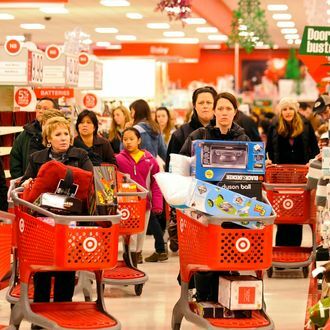 It appears people were more cautious with their money, but Black Friday sales morphing into a days-long event also contributed to the decrease in spending over the weekend. With several chains opening on Thanksgiving for the first time, 45 million people headed to the stores on Thursday, a 27 percent increase from last year. “Consumers were able to create a new tradition for Thanksgiving, of shopping Thursday after dinner,” said Marshal Cohen, a retail analyst with the NPD Group. We look forward to buying Sarah Palin’s next book on the commercialization of this proud American holiday.